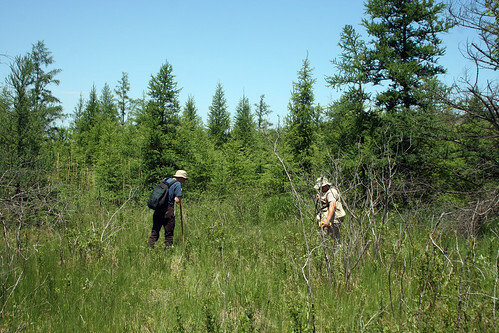 In May of 2009, I spent a day with herpetologist Dave Mifsud and his intern Max surveying a critical habitat type known as prairie fen. 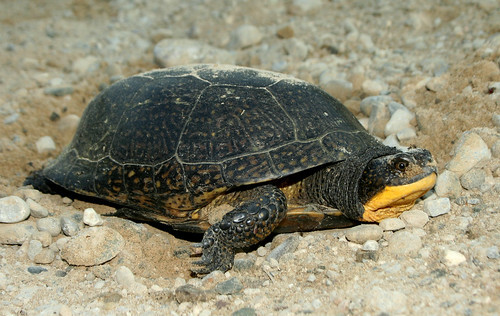 This fen exists on a lake margin and is home to several protected herp species in Michigan. Targets on this beautiful May day were the Eastern Massasauga Rattlesnake, Spotted Turtle, and Blanding's Turtle. Today was a real treat, as Jim Harding also joined us for the day. 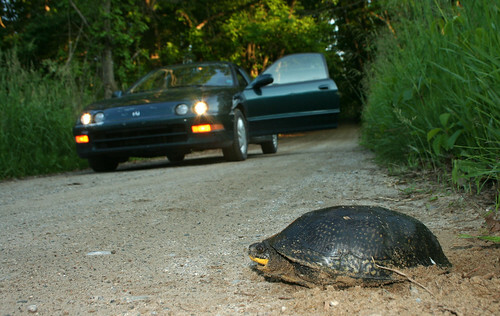 Jim is considered to be the "go-to" guy on Michigan herpetofauna. After brief introductions and conversation, we headed into the field. 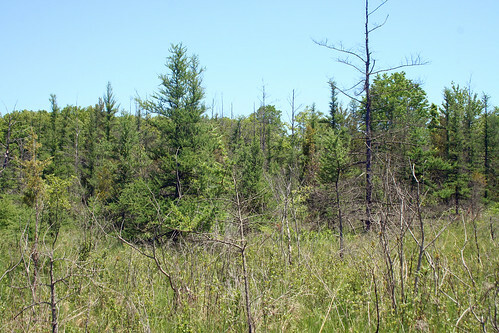 Fen habitats that are intact as this one, are critically fragile and important in Michgan. Fens are considered to be a peatland, meaning that they are composed of tons of decaying plant matter. This decaying plant matter is very old and can be dated back thousands of years from when the glaciers receded, meaning nutrient recycling in these habitats is very slow, and therefore makes them very fragile to human disturbance (development, pollution, etc.) Late May is a tough time of year to survey these sites for species as the cover becomes very thick and makes it difficult to spot snakes and turtles, here's Jim and Dave traversing the area. 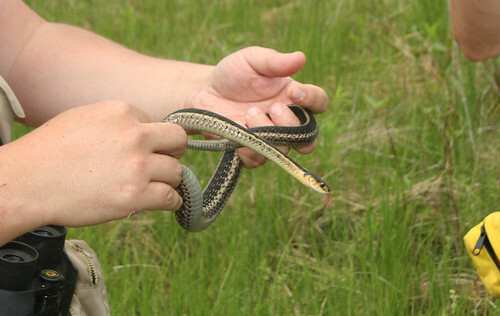 It took us awhile, but eventually we scored our first find of the day, a large gravid female Eastern Garter Snake. Dave is currently involved with some major projects in re-evaluating the distribution of Michigan herpetofauna and so even common species need to be documented at sites, we processed the snake and continued on our way. 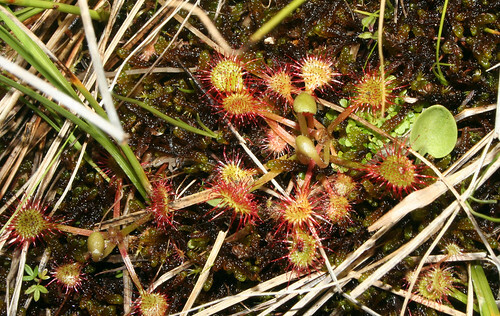 Another cool faunal component of peatlands such as this are species of carnivorous plants. The more common being the pitcher plant, and the less common being the sundew. We were able to come across a few sundew plants during the day, the biggest concentrations of them I've ever seen in the wild. One of the highlights of the day came around mid-day as we were traversing the fen. 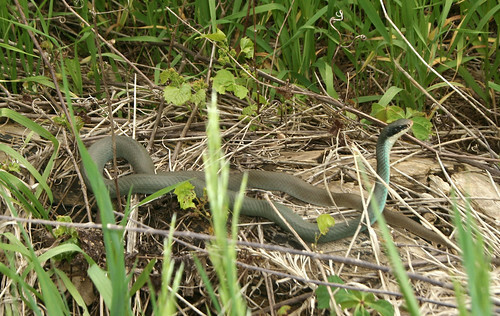 Max and I were out near the edges of the property when Max called out, "Blue Racer!" Immediately I ran over to see a beautiful adult Blue Racer basking in the hazy sunlight. Blue Racers are a snake I don't often get to see in the field and it was a great sight indeed. 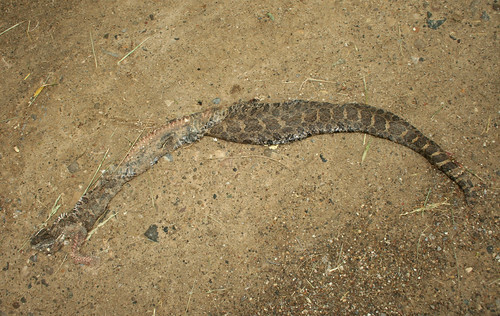 Unfortunately, we only managed a few shots of the snake before in darted away into the thick cover. Finding the racer was a huge lift for morale, and we headed off site to check some side roads to see if anything was about. Unfortunately, the road bordering the site we had just been surveying produced this sad sight. Anyway, we continued up the road and came across a much more encouraging sight! 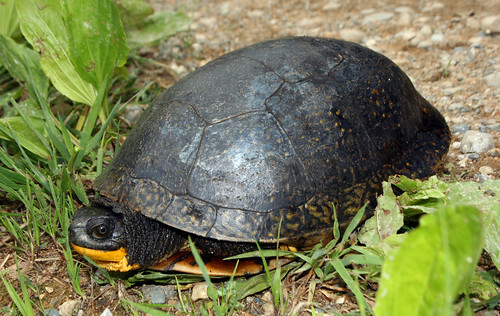 This adult female Blanding's Turtle had been excavating right on the edge of the road. 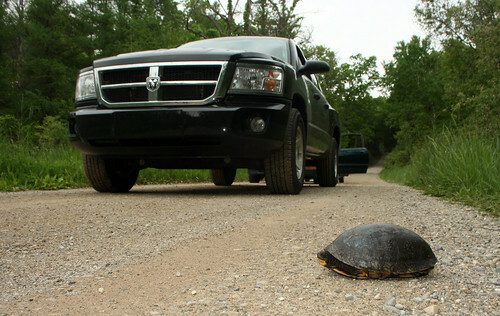 Blanding's Turtles and other Michigan turtle species have a bad knack of crossing roadways to nest or even nesting right on road enbankments. Jim picked up this girl and gently palpated her to find that she was still full of eggs. 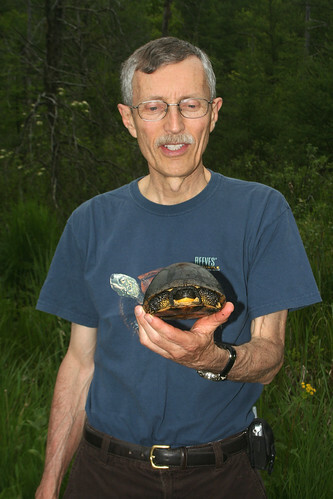 I had never palpated a turtle before, so it was cool to learn a lesson from Jim. It was a fantastic day despite the DOR massasauga, but overall we were able to document some cool species and enjoy each other's company. 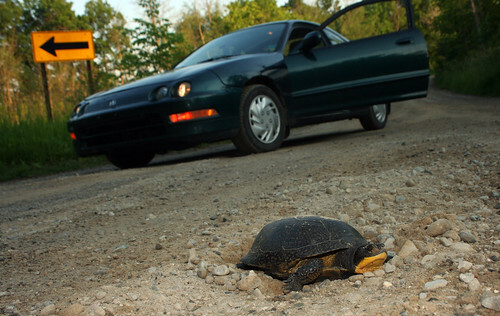 The Blanding's we found on the road warranted a few return trips from me which yielded more turtles excavating on the roadside, a reminder for Michigan residents to drive carefully during May and June.